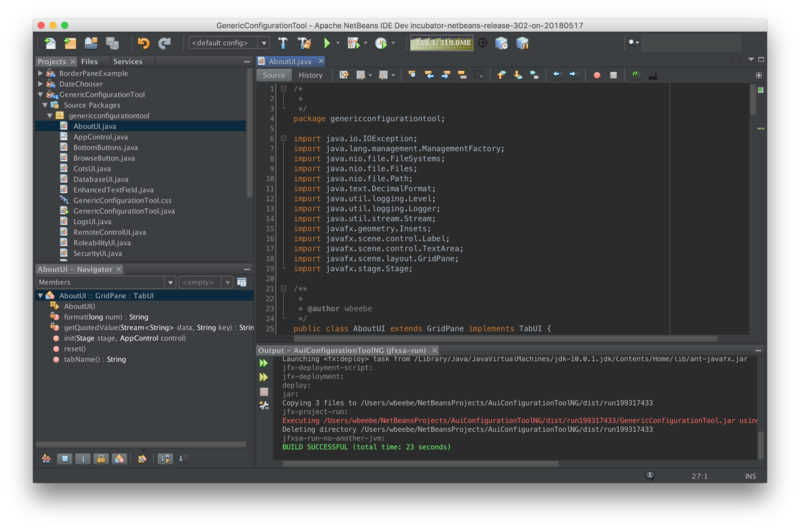 NetBeans 10.0 is the second release through Apache, the first being NetBeans 9. The group responsible for moving NetBeans out of Oracle’s shadow and into a position where NetBeans stands on its own has been hard at work. This second release adds new features as well as continuing the work of removing/replacing the older Oracle licensing and any non-open-source code that needs to be replaced. A complete “What’s New” page is here, and you can download NetBeans 10 here, but the key new features for the impatient are support for Java 11, support for PHP 7.2, and inclusion of JUnit 5. At the same time I stepped up to NetBeans 10 I rolled back to Java 8. Because I use JavaFX in many of my personal applications, when I tried to move forward into Oracle’s Java 11, the JavaFX libraries were of course gone from Java. Trying to add them back in via OpenJFX became such a problem that I made the decision to revert all my changes and go back to Java 8. Unfortunately, Oracle’s Java 8 open support ends January 1 2019, and I’ve never a decent version of OpenJava work for me (at least on Linux), so I went looking for an alternative to Oracle and found Amazon’s Corretto Release. For those of you who develop in Java on macOS and want to use NetBeans 10 as a regular macOS applications (i.e. startable via LaunchPad), I’ve written a modest Bash shell script that will take the NetBeans zip file and create a compliant Mac application from it underneath ~/Applications. It’s checked into Github here. You use it just once to install the zip. I used it to install NetBeans 10. Because NetBeans 10 is installed into ~/Applications you don’t have to execute the Bash script as root via sudo. It’s been a long time coming. Netbeans, which is now a part of the Apache Foundation, announced Netbeans 9 RC1 back on May 28 (go to https://netbeans.apache.org/ to stay abreast of Netbeans’ news and to download the latest releases). RC1 downloads as a zip file, which I was able to unzip onto my MBP. That leaves the complete application sitting in a netbeans folder. Step into netbeans/bin and execute the netbeans shell script to bring up Netbeans 9. No problems, no issues. I like the fact it doesn’t require an installer and frankly hope they keep it this way. It even found my older Netbeans 8.2 installation configuration and, miracle of miracles, found and loaded my Darcula (that’s spelled correctly, by the way) LAF plugin. Darcula is working just fine as you can see in the screen shot. All of this is working with Java 10.0.1. The project loaded above builds and executes just fine under Java 10. I said earlier that Netbeans 9 has been a long time coming. That’s because it was originally slated to be released the same time Java 9 was released back in September 2017. Here we are mid-2018, a good nine months after the initially planned release date. I know a lot of effort went in to making this happen, what with the shift out from Oracle and to Apache, which required additional effort to remove all copyright notices from all the source files (I was a lurker to the ongoing process). They finally finished to the point where they are releasing a near-final Netbeans 9. Of course, if you were following along, you could pull a copy of the Netbeans source and build it yourself, which I did a number of times just to observe the progress. Netbeans 9 is now reaching an official release point. The group behind the release of Netbeans 9 is to be commended for their hard work and dedication. They did a superb job from what I’ve been able to see so far. For those that intend to continue working with Java, have been waiting for Netbeans 9, and plan to move to Java 11, Netbeans 9 is an excellent tool.